In the world of rear-wheel-front-engine sports cars the Toyota 86 is unmatched. 2018 sees the storied sports car taking even more steps toward making it untouchable in its class. With the induction of Scion in to the Toyota brand, the exciting former Scion FS-R lives on in the 2018 86. 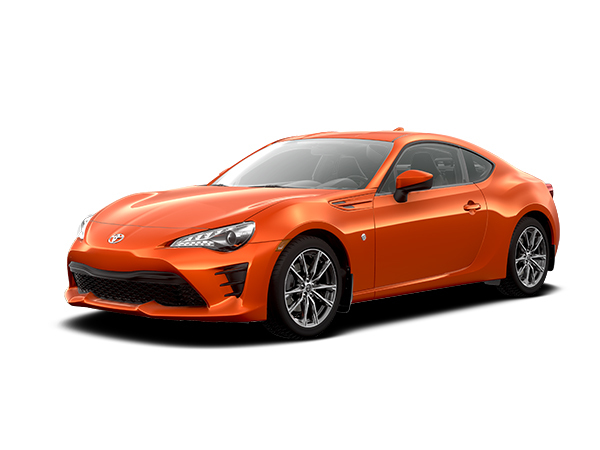 Merging these two sports cars has only increased the performance, features, and fun that were standard with the already top class Toyota 86. Come see the 2018 Toyota 86 for yourself today at Sherwood Toyota. As always, the Toyota 86’s performance capabilities are its claim to fame. For 2018 the horsepower and torque have increased to 205 and 156 ft.-lb. respectively, getting up to highway speeds in 6.8 seconds. The shocks have been fine-tuned while the suspension has a revised spring rate. All of this means increased agility and better control in a variety of driving situations. A Torsen® limited-slip differential distributes power to both rear wheels while the reinforced structure and revised tunings make it stiffer up front for enhanced turning. The manual transmission has had its gear ratios upgraded and given shorter throw to make the driving experience even more exciting. The 2018 Toyota 86 clocks in with fuel economy sports car enthusiasts will adore at 11.3 L/100km in the city and 8.3 L/100km on the highway. For a car that is focused on driver fun it’s important to remember that the top priority will always be safety, delivering on the expectation to keep everyone safe no matter their destination. Standard on the 2018 Toyota 86 is anti-lock brakes and stability control, along with the limited-slip differential improving grip and traction in all situations. The rear-view camera helps you keep your eyes on even the hard-to-see parts of the road while gliding in and out of tight parking spots with ease. The NHTSA gave the 86 a four-star score on frontal crash protection and five stars for rollover protection. Along with six standard air bags, every 2018 Toyota 86 comes equipped with Toyota’s STAR® Safety System including: Vehicle Stability Control, Traction Control, Anti-lock Brake System, Electronic Brake-force Distribution, Brake Assist, and Smart Stop Technology. Designed to keep you safe no matter where your travels take you, the 2018 Toyota 86 lets you drive with confidence and peace of mind. On the outside, we’ve decided to give the 2018 Toyota 86 a full makeover. The front of the grill has a larger grill, with both the front and rear getting an edgy styling with aggressive lines and curves. The front fenders are still elevated above the wheels, though new trim inserts around the car give it a dominating visage. The car rests on ten-spoke, 17-inch alloy wheels and is positioned low to the ground. On the inside the 2018 86 is similar to the previous model at a quick glance, with new details and definition noticeable upon a second look. There is an upgraded three-spoke, leather-trimmed steering wheel which has tilt/telescoping ability and built-in controls for entertainment and cruise control. The front seats are both manually adjustable, while the rear seats fold flat to let you carry more cargo when needed. The trunk has plenty of storage space by itself, with the ability to house four tires laid flat. The in-dash entertainment display is sleek and stylish, with a maturity more befitting than seen before. The 2018 Toyota 86 has received some significant technological upgrades since last year. Some of the standard features now include a rear-view camera, automatic climate control, remote keyless entry, and cruise control. Inside the cockpit the Pioneer® audio system comes with eight speakers and a 7.0-inch touch screen. This entertainment system includes an auxiliary jack and USB port, plus it can be voice controlled. There are also smart features like hill-start assist and the engine control module, which keeps engine revs stable during downshifting. The 2018 86 also comes with an incredible host of the latest standard safety features included in Toyota’s STAR® safety system. The Toyota 86 is deep-rooted in sports car history. The integration of the best features from the Subaru BRZ and, now, the SCION FS-R into its design truly makes the 86 a powerhouse in its class. Unmatched safety features and performance make the 2018 Toyota 86 an amazingly fun drive, from the novice driving their first sports car to the seasoned, scrutinizing veteran. Stylish design keeps the 86 at the front of its class for looks while the power from under the hood keeps it well ahead of the competition. Come see the 2018 Toyota Corolla today at Sherwood Toyota, 31 Automall Rd, Sherwood Park, Alberta to set up a test drive. If you have any questions please call our expert Sales Staff at (780)-410-2455.